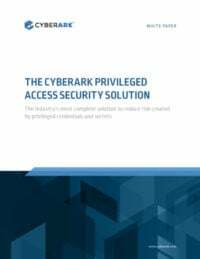 Gartner Names CyberArk a Privileged Access Management Leader. More than half of the Fortune 500 trust CyberArk to protect their most critical and high-value assets. Learn more about what sets CyberArk apart. Number One in Privileged Access Security. CyberArk is customer focused, offers a strong set of solutions with a complete vision for the future. CyberArk has teamed with the world’s leading technology providers to create the industry's only Privileged Access Security Marketplace with hundreds of certified hardened joint solutions and plug-ins. Leverage insights from the industry’s only threat research lab. Our overall experience with CyberArk has been exceptional from planning implementation through to steady state. Up your security IQ by checking out our collection of curated resources including ebooks, webinars and videos covering a wide-range of security topics.